Tender and crispy beer falafel made from scratch, starting with dried chickpeas. 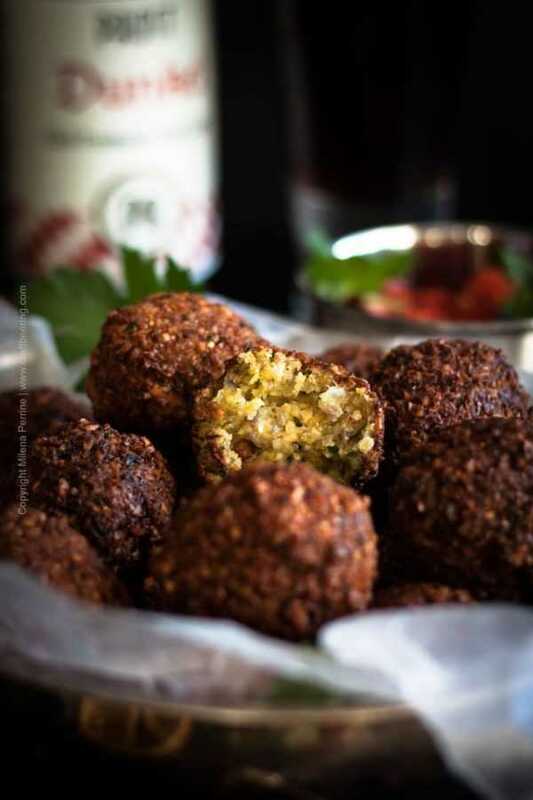 Falafel is a small fried patty (or ball) made of a mixture of ground chickpeas, spices and onion. 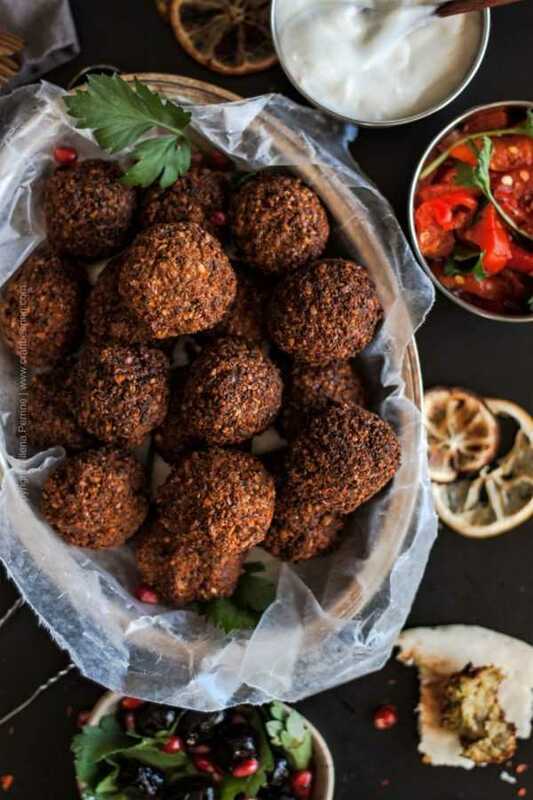 It is an extremely popular street food in Middle-Eastern cuisine and is also considered the National dish of Israel. 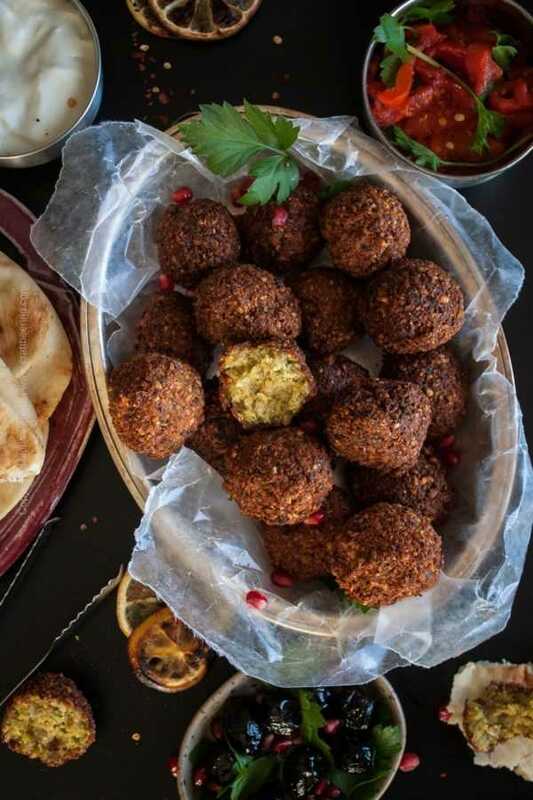 Falafel is thought to have originated in Egypt. The authentic ingredients in falafel are chickpeas (dried, need to be re-hyrated in water), onion, garlic, flour, parsley, cumin, salt & pepper. Sometimes cilantro or ground coriander are added. Preparing falafel from scratch is definitely the way to go. Avoid using chickpeas from a can. If you have ever made falafel with chickpeas (aka garbanzo beans) from a can you may very well have had a mini fiasco experience. The kind where your entire chickpea mixture transforms into mush and falls apart as you try to fry little balls/patties. Sadly, I speak from personal experience. I had almost given up making my own falafel a few years ago when Chris told me that I should soak dry chickpeas in water, which made all the difference. That and controlling the temperature of the frying oil. You are aiming for a coarse paste which is most easily achieved by blitzing the re-hydrated chickpeas and other ingredients in a food processor. I love, love, love falafel and ate copious amounts of falafel stuffed pita pockets growing up. It was everywhere. Without a doubt it is one of my most favorite middle Eastern ‘sandwiches’. Second favorites being soujouk and döner. I also like to add a few freshly fried falafel balls to a simple green salad or my beloved Bulgarian Shopska salad and call it a meal. Falafel is one of the foods I’d sorely miss if somehow I could not have it again. Not long ago a friend and I were munching on some freshly fried falafel hugged by soft pita bread and drizzled with tahini. We were having beers and both made comments about how falafel pairs great with beer and goes well with so many flavorful fresh dips, olives and veggies. She asked if Chris and I had a recipe to make falafel with beer. It seemed only logical to her that we would have one handy. We do now:). since there is no feasible way to flavor a falafel mixture with beer (its typical moisture content being already high, it could not possibly absorb more liquid) the only way to do it is to let the chickpeas soak in a suitable beer and become infused with its flavors as they absorb liquid. I told my friend I’d give it a try. Said and done. To the best of my knowledge, at the time I am writing this, you are looking at the world’s third ever batch of beer falafel made from scratch in the pictures of this post. (Batches one and two were practice towards perfection). Perfectly crispy outside, soft, airy and delicious goodness inside. With just enough of a malty touch to excite the palate. Very subtle. Very excited to share this Perrine original recipe with you all. It is a bona fide star in the cooking with beer recipe universe of the Perrine craft beering family. 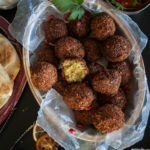 What Beer Style to Use in Beer Falafel? I chose to use (among several suitable options) one of Chris’ favorite beer styles ever. A South German Dunkel lager, ie a dark amber lager (‘dunkel’ = ‘dark’ in German). There are actually two main Dunkel styles – the more famous Munich Dunkel and the lucrative Franconian Dunkel. They are very similar, with the latter being less sweet, somewhat stronger and finishing drier. Franconian dunkel has a dark bread(y) nose, smooth and medium bodied with confident toasty maltiness and a barely perceptible nuttiness and dark fruitiness. It has less caramel candy flavor than you’d find in a Munich Dunkel and is very crisp with a dry finish. Plus Munich style dunkels tend to be chocolaty which is not what I wanted in my falafel. You do not need me to tell you to stay away from anything too bitter or fruit flavored or too chocolaty or coffee flavored for example. I wouldn’t even use wheat beer because of the banana and clove yeast esters. Chickpeas taste naturally nutty and you want a brew with grain bill participants contributing complementing flavors. Toasty and malty, with barely perceptible hoppiness. Not too boozy either. This naturally puts German lagers on top of the list, but I’ve taken the liberty to suggest more options even though as of right now I have not made the recipe with each and every one of them. Give me a year and I will get there, at the rate I tend to eat falafel. The flavor infused by the beer is ever so mild and polite – it does not compete for the spotlight and acts in support of the chickpeas and as an ally to the other ingredients added. Don’t forget that there is garlic, and pungent parsley, and cilantro, and onion and cumin for your taste buds to consider. German lagers actually shine in recipes with cumin. My favorite dish of all times involving beer is pork with cumin and pilsner which I am yet to make for the blog. It is my mother’s recipe. 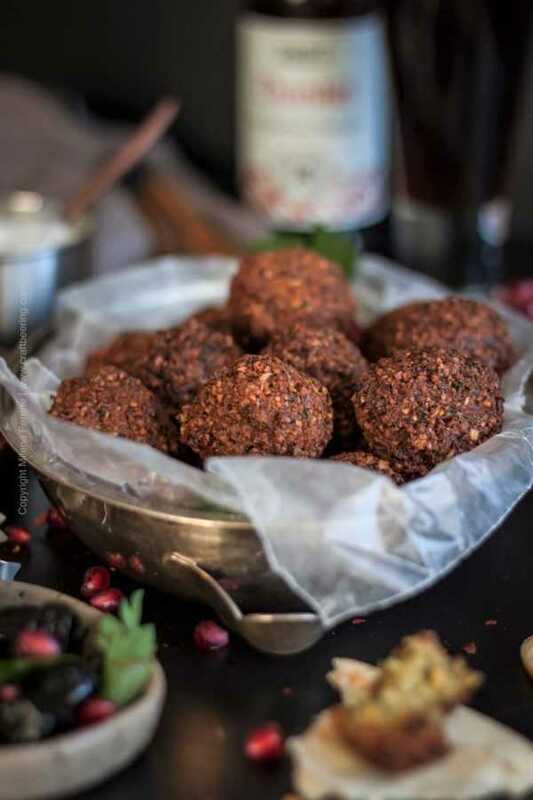 For now I hope you will soak some chickpeas in Dunkel lager and follow the rest of the recipe to reward yourself with delicious beer falafel. Cheers, friends! If you enjoyed spending time on Craft Beering we sincerely invite you to join us on Instagram, Facebook, & Pinterest or enter your e-mail in the subscription box at the bottom of each post (we’ll send you a list of all new posts every two weeks). Tender and crispy beer falafel made from scratch, starting with dried chickpeas. An infusion of subtle toasted bread and malty flavors courtesy of Dunkel lager complements the nuttiness of the chickpeas and the pungency of the other ingredients. Overnight soaking for at least 12 hours required. Place the rinsed dried chickpeas in a bowl and pour the Dunkel lager over them. It should cover all the chickpeas. If not, add a little bit of water. Soak overnight or at least for 12 hours, refrigerated. Drain the chickpeas and place inside a steel blade food processor. Add the onion, garlic cloves, parsley and cilantro and the cumin, salt, pepper. Process to blend, do not allow the mixture to turn into puree. Ideally, you want small chunks, about the size of rice grains to be visible throughout. Transfer to a mixing bowl and dust with the flour and baking powder. Using a fork mix to incorporate them into the chickpea mixture. The mixture should have a consistency that allows you to form small balls using your hands, just over the size of a walnut. You might need to add a little more flour to achieve a manageable texture, but first test the mixture you have with one ball. Heat up the vegetable oil to 375ºF. You must be careful to maintain the temperature at that level. Test with one falafel ball to be sure both chickpeas mixture and oil temperature like each other. Fry for just under 2 minutes. If the ball begins to fall apart in the oil, add more flour to the mixture. If not, go ahead and make more. Do not fry more than 5 balls at a time. Drain on paper towels before serving. Best eaten while still warm and crispy. These look and sound delicious and your photos are really beautiful. Thank you, Cat for stopping by with a kind word! What a beautiful presentation for your delicious Falafel! Thanks so much for sharing your post with us at Full Plate Thursday this week. Hope you have a great day and come back soon! Falafel are one of my favorite foods of all time. Unfortunately, the best place to go is a full 40 minutes away (without traffic) and is in a Kosher deli, so it’s not open on Saturdays. We’re lucky to go once every three or four years. Anyway, all that was to say that I can’t wait to try this recipe. It looks SO good. Thanks so much for sharing at the #happynowlinkup! This is so creative and what an accomplishment. Your recipe sounds delicious. Thanks for linking up at the Home Matters Linky Party. 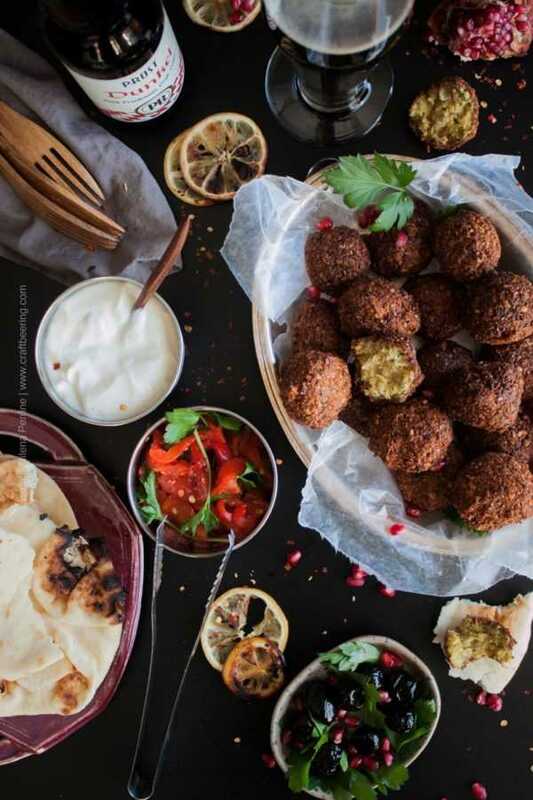 I’m a falafel freak and won’t rest until I’ve tried them all ~ this gorgeous recipe is next! Thank you so much, Sue! Means a lot coming from you! First of all, the photography in this post is amazing! Second, I LOVE falafel but I haven’t made it at home… yet. Your post is giving me inspiration. Third, if I’m going to make falafel at home, you best believe I’m making it with beer! I agree with your attitude, Christina! May as well add the extra flavor from a bready, malty beer if you’ll be waiting for the chickpeas to soak all night, right? Thank you for stopping by! These look so tasty! I’d love to try them! Hey, Karrie! I am sure that you know what you are talking about when it comes to falafel. Cheers! I couldn’t believe how much better falafel turns out when soaking the chick peas at home versus using canned one. Third times a charm, right 😉 ? Before I even read down through, I was, like, ‘Pinning!’ I absolutely love falafel, but don’t near make them enough. I’ve never made with beer so now is totally the time to try. They look so crispy on the outside and moist inside. Perfect with a beer (of course). Have a wonderful week, you guys!! Thank you, Jennifer. It is really fun to make falafel (I say this now of course, lol). Looks delicious. And beautifully presented. Thank you very much, Amalia! Words cannot describe how much I love falafel. But I’ve only made it at home once and it was just as you described–disastrous. Your pictures have me craving it though, so it’s time to be brave and try it again. . .with beer! That’s brilliant! Hope you’re having a great weekend! So with you, Kelsie! Falafel is magical, really is. I’d eat it with or without the beer, but definitely enjoyed the extra layer of flavor, even though not at all that strong.